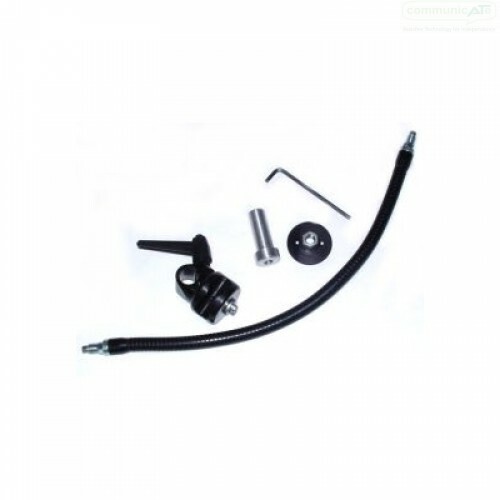 This FlexiArm Mount Kit is designed for switches and for solid attachment to round tube. The Releasable clamp allows removal of the FlexiArm whilst the Accessory Mount Clamp stays attached to the round tube. The Stem FlexiArm Releaseable Switch Mount provides the components for a simple, flexible switch mount. Excellent for switch position assessment and short-term solutions, the Stem FlexiArm can be repositioned and adjusted without the need for tools. The FlexiArm component of this mount kit is a 51 cm length of flexible material fitted with external threads at each end. At one end, the FlexiArm is attached to a Clamp End Fitting and at the other, a Switch Mount Plate. The Clamp End Fitting fits into the Accessory Mounting Clamp, a 1" round (25mm) clamp that forms the anchor of the Switch Mount on round tube. This may be changed to 7/8" round clamp if required, subject to the diameter of the tubing the kit is to be attached. All attachment are then tightened with an Allen key or a spanner (switch plate). 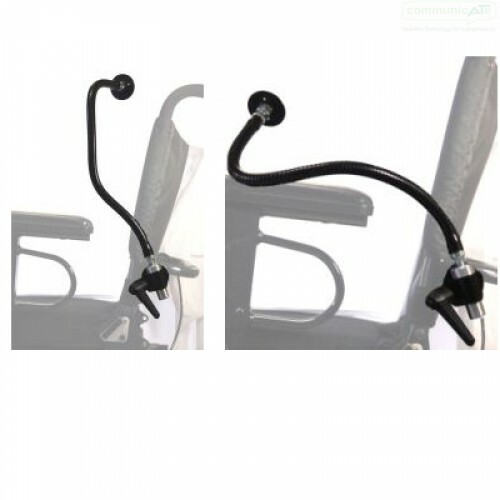 The Accessory Mount Clamp has a release handle which, when loosened, allows the Clamp End Fitting holding the FlexiArm to be lifted slightly off a locating Pin which sits in a Notch on the underneath of the Clamp End Fitting. The FlexiArm can then be rotated and swung to the side or removed from the clamp entirely. As with all DAESSY systems that use Pin and Notch, this gives the FlexiArm automatic repositioning when replaced back into the Accessory Mount Clamp and stops inadvertent swinging if the release handle isn't tightened. A built in safety/positioning mechanism of the simplest type. This Switch Mount provide solid connection and anchoring to the tubes of wheelchairs and offers a flexible switch mounting solution for assessment or evaluation or for where needs are changing.